While some may think Vermont is all about maple syrup, there is so much more to the story. Vermont leads the nation in the local food movement, relying faithfully on local farms and small businesses to keep its independent ‘food chain’ vibrant and strong. Our area restaurants are strikingly diverse in their offerings, perfect for lunches and dinners when you stay at our bed and breakfast. Distances and times shown are “from the inn” measures. Mr. Darcy’s Bar & Grill (3 miles, a couple of minutes) This upbeat pub atmosphere offers traditional fare with creative twists at comfortable prices. Sam’s Steakhouse (3 miles, a couple of minutes) Great food, extensive salad bar, excellent service. 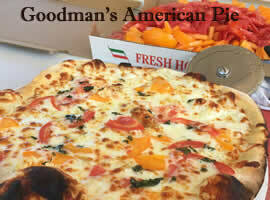 Goodman’s American Pie Wood-Fired Pizza (5 miles, 10 minutes) Serving the best pizza around. Eat-in or take-out. Might as well eat in though — not only do they now serve beer and wine, but they have a pool table and vintage video games! DJ’s (5 miles, 10 minutes) Casual, comfortable, affordable: a local favorite. 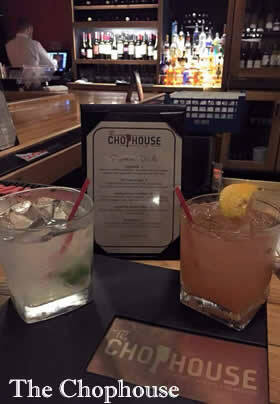 Downtown Grocery (5 miles, 10 minutes) Fine farm-to-table dining in a casual, upbeat setting with extensive blackboard specials that change daily. Inn at Weathersfield (15 miles, 20 minutes) A true foodie’s favorite. 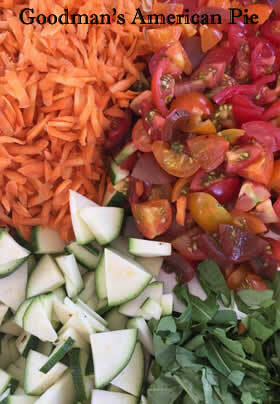 An elegant culinary experience, specializing in local foods. Two menus: full restaurant and simpler fare in the tavern. MacLaomainn’s (10 miles, 15 minutes) Small, intimate pub with great beer and Scotch selections. Menu includes traditional Scottish classics such as neeps, tatties & haggis, and bangers & mash! The Killarney (4.5 miles, 10 minutes) Irish comfort food in a fun and lively setting. Evenings often feature live music, game and trivia nights, or sports viewings. 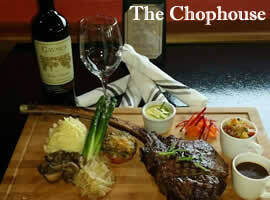 The Chophouse (5 miles, 10 minutes) This steakhouse aims to set itself apart in its selection and quality of steaks. At the base of Okemo Mountain Road, this might be a nice place to skip the end-of-day ski traffic. The Castle (1 mile, a couple of minutes) A truly elegant ambiance: a wonderful place for a special evening or celebratory dinner. Contact The Castle for details on their $25 3-course meals. Stemwinder (5 miles, less than 10 minutes) A Vermont style tapas bar: local ingredients, small plates, daily blackboard specials. The Pot Belly (5 miles, less than 10 minutes) Traditional pub fare; a great spot to grab a sandwich. Fullerton Inn (9 miles, 15 minutes) Eat in the dining room or pub for great food in a relaxing northern setting. Tacos, Tacos (4 miles, 10 minutes) Counter service, but not quite “fast food”. Abundantly portioned tacos, burritos, etc. for take-out or eat-in. The Free Range (9 miles, 15 minutes) Locally owned, locally sourced, in a Victorian building on the Chester Green: serving American fare for brunch, lunch and dinner. Echo Lake Inn (9.3 miles, 17 minutes) Fine dining located in the historic Echo Lake Inn serving a variety of elegant plates. 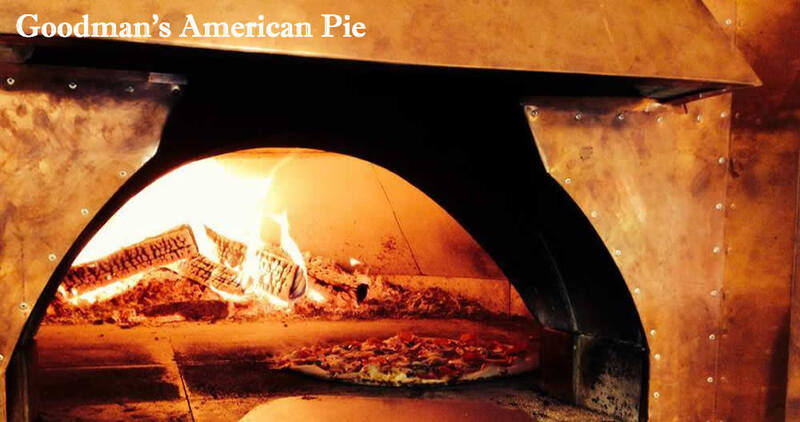 La Tavola (5.9 miles, 11 minutes) Italian dining serving locally and seasonally sourced food. Du Jour (4.4 miles, 8 minutes) Casual dining offering comfort food for both lunch and dinner, in addition to nightly specials like taco Tuesday. MAMA’s (4 miles, 8 minutes) Italian cuisine serving fresh, house made pasta for both lunch and dinner. Murdock’s On the Green (1.3 miles, a couple of minutes) Locally owned and specializing in fresh, farm-to-table food in a pub-like atmosphere. Mojo Cafe (3.7 miles, 6 minutes) Modern Tex-Mex dining serving unique options for lunch and dinner, dine in or take out. Homestyle Hostel (3.8 miles, 6 minutes) Fresh fine dining and craft cocktails in a relaxed environment. Stonehearth Inn and Tavern (9.7 miles, 15 minutes) Comfort food offered in a cozy tavern environment with unique wines and ales, locally and seasonally sourced. Outer Limits Brewing (1.2 miles, a couple of minutes) A new brewery and restaurant coming to the Okemo Valley in Spring, 2019.